BBC News – The British scientist who explained the Universe to millions died peacefully at home aged 76. British astronaut Tim Peake said Prof Hawking “inspired generations to look beyond our own blue planet and expand our understanding of the universe”. He was famed for his work with black holes and relativity. The British scientist who explained the Universe to millions died peacefully at home aged 76. A book of condolence has been opened at Gonville and Caius College in Cambridge, where Prof Hawking was a fellow. Prof Hawking was the first to set out a theory of cosmology as a union of relativity and quantum mechanics. He also discovered that black holes leak energy and fade to nothing – a phenomenon that would later become known as Hawking radiation. Through his work with mathematician Sir Roger Penrose he demonstrated that Einstein’s general theory of relativity implies space and time would have a beginning in the Big Bang and an end in black holes. The scientist gained popularity outside the academic world and appeared in several TV shows including The Simpsons, Red Dwarf and The Big Bang Theory. The Big Bang Theory ✔@bigbangtheory In loving memory of Stephen Hawking. It was an honor to have him on The #BigBangTheory.Thank you for inspiring us and the world. He was portrayed in both TV and film – recently by Oscar winner Eddie Redmayne in The Theory of Everything, which charted his rise to fame and relationship with his first wife, Jane. 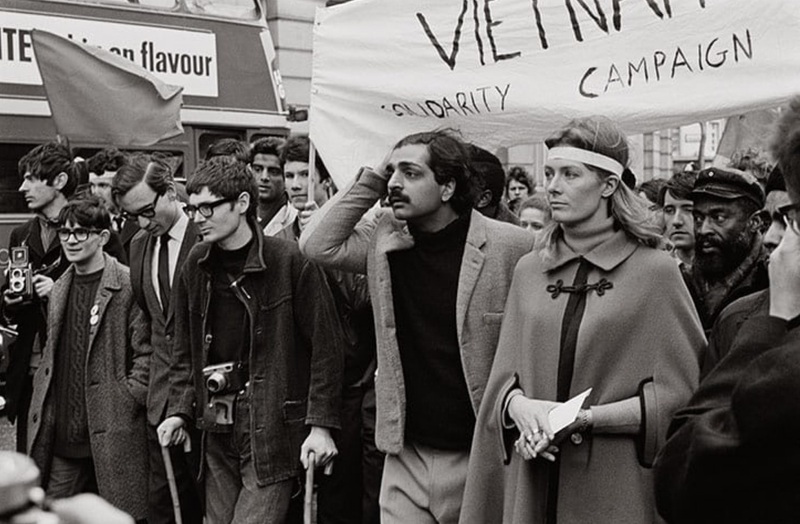 Stephen Hawking marching with Vanessa Redgrave and Tariq Ali against the Vietnam War – London, 1968. Benedict Cumberbatch, who played Prof Hawking in a BBC drama, said he was “a true inspiration for me and for millions around the world”. His most famous book – A Brief History of Time – has now shot to the top of the Amazon Best Sellers list. The Motor Neurone Disease Association, of which Prof Hawking had been a patron since 2008, reported that its website had crashed because of an influx of donations to the charity. Tributes have poured in for Prof Hawking since the announcement of his death. Prof Lord Martin Rees, the Astronomer Royal, who was at university with Prof Hawking when he was diagnosed, said his friend had “amazing willpower and determination”. Prime Minister Theresa May called him a “brilliant and extraordinary mind” and “one of the great scientists of his generation”. Sir Tim Berners-Lee, inventor of the web, said: “We have lost a colossal mind and a wonderful spirit. Rest in peace, Stephen Hawking,” he said. The vice chancellor of the University of Cambridge – where Prof Hawking had studied and worked – Professor Stephen Toope, said he was a “unique individual” who would be remembered with “warmth and affection”. Prof James Hartle, who worked with him to create the Hartle-Hawking wavefunction to explain the Big Bang, said Prof Hawking had a “unique” ability to “see through all the clutter in physics” and get to the point. The comedian and presenter of the BBC’s Stargazing Live Dara O’Briain said the scientist had an “immeasurable life” and “one of the few people I would call a hero of mine”. Theoretical physicist, professor Jim Al-Khalili, from Surrey University said Prof Hawking had a tremendous sense of humour. British astronaut Tim Peake said Prof Hawking “inspired generations to look beyond our own blue planet and expand our understanding of the universe”. Stephen Hawking arrives on the red carpet with former wife Jane Hawking (L) and daughter Lucy Hawking (R). In his 2013 memoir he described how he felt when first diagnosed with motor neurone disease. “I felt it was very unfair – why should this happen to me,” he wrote. Speaking to the BBC in 2002, his mother, Isobelle, described him as a “very normal young man”. Did you ever meet Stephen Hawking? Share your memories of him by emailing haveyoursay@bbc.co.uk.